There’s been a fire kindling in Whittier in recent years–leaving a trail of embers still smoldering in nearby Boyle Heights, Downtown, and Monterey Park–where some of L.A.’s most iconic restaurants reside, created by a chef too humble to claim such a feat. Chef Ricardo Diaz is responsible for Cook’s Tortas and the popular mini-chain Guisados, which has garnered a mass appeal among the new taco-savvy Angelenos. Although he’s parted ways with both of those restaurants, the draw remains Diaz’s flavors, which have evolved at Bizarra Capital (a tribute to his conflicting fascinations with Mexico City) and Colonia Taco Lounge (where he’s taken his guisados to the next level). Colonia Publica continues Diaz’s journey into what we call Alta California cuisine, a combination of formative Mexican food experiences shaped by California cuisine, multiculturalism, and the bounty of local products found at our farmers’ markets. This time, it’s fideos, or pasta soups, that’s the latest passion for Diaz, a passion born from playful experimentation that’s now has become an essential dining experience in Whittier. Chef Diaz also serves mulitas (like a taco sandwich) and craft beers, but fideos are the star. These aren’t your abuela’s fideos, nor are they the Knorr-fueled MSG bombs served at many comida economica restaurants (affordable diners) in Mexico, but a heaping bowl of carefully fried pasta in tomato sauce that’s finished in a tasty, natural broth. There’s a checklist of adds to your fideos: queso fresco, chicharron, sliced avocado, and hard-boiled eggs as well as unconventional items such as cilantro chutney or egg drop, which is the beauty and freedom of pocho gastronomy. Fideos are one of those dishes we make at home, turned into a main attraction with all the fixin’s. 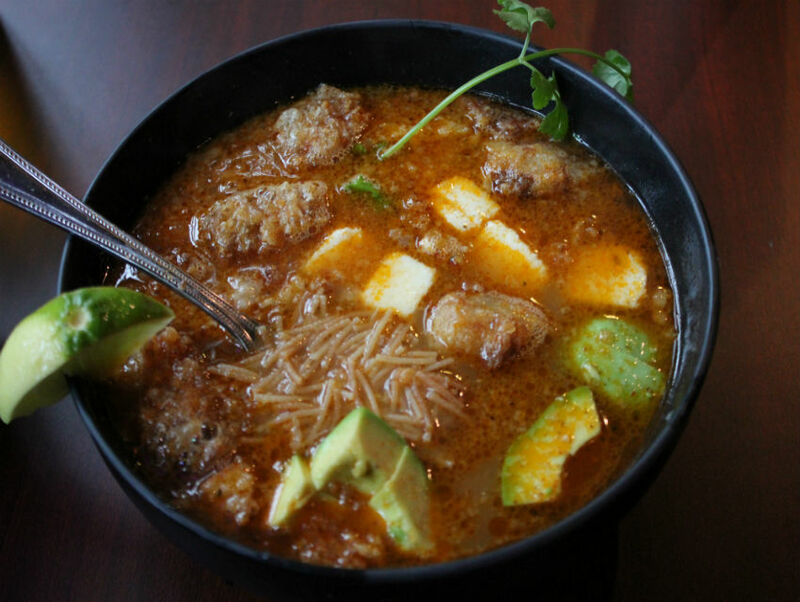 I ordered the massive bowl at Colonia Publica with my personal favorites: avocado, cheese, chicharron, and hard-boiled eggs (at home, I drop fried eggs in my fideos) and enough heat to make you cough and sweat. These fideos just happen to be light years ahead of mine or yours, and my abuela would roll her eyes and scold me if I had this much fun with her pasta soup.